Louise Gray's fashion is very bold, bright and sparkly, so the make up collection lived up to her name. With gorgeous bold lipsticks, blushers and nail varnish, each piece is a statement. I'm lucky to get my hands on the bold blue sparkly liquid eye liner and a lipstick in Mexican Wave, and I am going back tomorrow to pick up a few more goodies! The collection is half price at the moment online at Topshop or pop in store. You can't get the eye liner online, but luckily found it in store today. I'll give you my swatch and ideas on the eye liner tomorrow, but today I wanted to share the lipstick with you. 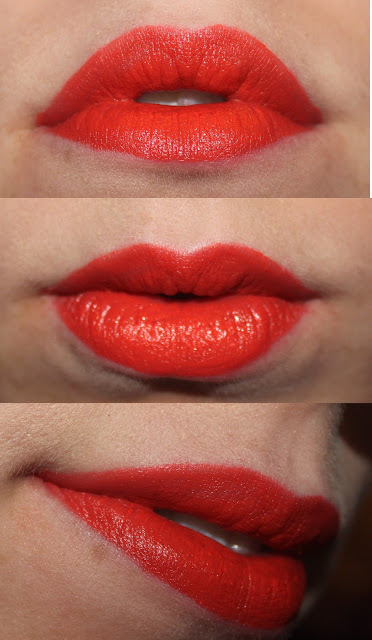 The base colour to this gorgeous lipstick is red, with a orange tone to it. I usually stick to coral lipsticks, and the ones that aren't too bright either, but this lipstick suited me really well. It's a very bold red and complimented my pale skin tone, but I know it will suit tanned and darker tones too due to it's orange tones. The lipstick texture was similar to other high street brands, but had more of a staying power - But not as good as Mac. That aside, I love this lipstick. At a small price of £5 you can't complain. A gorgeous colour which will only be around until the sales are over, so get something from this line while you can! I don't usually go for Topshop branded Lipstick, but I was not disappointed. The packaging for this beauty was sleek and striking, with the pastel pink shade with the regal gold pattern on the side, a pretty addition to your make up bag. 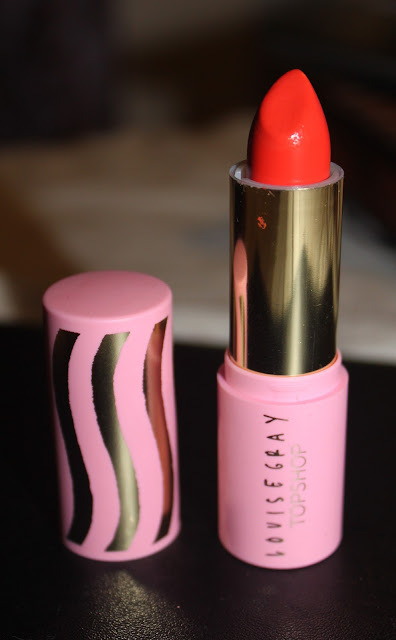 Overall I loved the lipstick, and as I said - I'm going back to find some more by Louise Gray tomorrow!! I gave this little stunner a 8/10 due to it's beautiful colour and staying power. Hope you enjoyed reading this post, and here are a few pictures of me wearing the colour below. Get the colour now here reduced from £10 to £5 http://www.topshop.com/webapp/wcs/stores/servlet/ProductDisplay?beginIndex=1&viewAllFlag=&catalogId=33057&storeId=12556&productId=6349202&langId=-1&sort_field=Relevance&categoryId=649132&parent_categoryId=459528&pageSize=21, or get it in store.